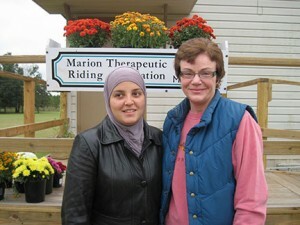 Each Friday morning you’ll find 25-year-old Mona Minkara and Tina Gorske, her friend and driver, at the Greenway MTRA. They drive in from University of Florida, where Mona is a graduate student in chemistry. “She knits and I talk,” says Tina, when asked how they spend their hour drive together from Gainesville to the Greenway facility. Mona is blind. Prior to coming to MTRA she had not ridden horses, but always had a desire to do so, saying that her great grandmother was known to be an accomplished equestrienne. Mona explained that she found out about MTRA through a meeting with former Director Kate Robbins when she was seated next to her on a flight home to Boston, MA. Once Mona returned back to Gainesville, she immediately began investigating how she could participate in the MTRA program. She met roadblocks at every turn. Transportation Services advised her they could not travel outside Alachua County. Florida for the Blind told Mona they were unable to accommodate her because the request did not relate to medical or educational needs. When Mona checked into taxi service she found it was far too expensive to travel into Marion County. Her last resort was a conversation with the University’s Director of Disability Services, Jim Gorske. Jim listened to Mona’s story about MTRA’s program and the obstacles Mona was encountering to getting transportation. He told her to give him some time to see what he could do. “I could not believe it when Jim called me back and told me, ‘My wife is willing to take you,’” Mona said. Jim’s wife, Tina, is a person who truly understands the effect disability can have on a person’s life. In addition to having knowledge through her husband’s work, Tina’s own life was significantly impacted by a recent car accident. Mona is taking a sabbatical from riding as she is doing her graduate work. We hope to see her back soon! To become involved with MTRA as a volunteer, click on “You Can Help” at the top of this page.